Twelve-year-old Sadie loves helping her mom with her wedding planning business, and with Sadie's mad organizational skills, she's a natural! That's why it's so devastating when her mother “fires” her after a Little Mermaid-themed wedding goes awry. Before long, RSVP -- your one-stop shop for the most creative parties in town -- is born. Of course, Sadie can't wait to prove herself to her mom, but the other girls also have their reasons for enlisting: Vi has her eye on the perfect gift for her hardworking dad, and Becca's all aflush at the thought of connecting with Ryan, the new Irish cutie in town. And though Lauren thinks she's too busy with summer studies to “officially” join, she's willing to help out in any way she can. But in this particular party-planning business, nothing goes according to plan! Sadie's mom is a perpetual no-show, Vi's archrival is dead set on ruining her summer, Becca can't seem to get Ryan to glance in her direction, and Lauren keeps choosing studying over her friends. Is the girls' friendship strong enough to survive a business? 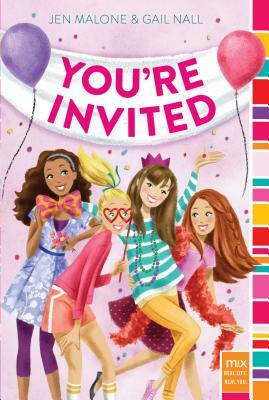 Or does RSVP spell the end of these BFFs?